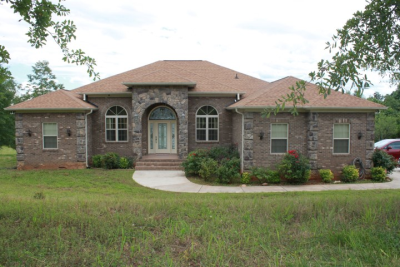 Immaculate custom made brick home w/ stone columns and grand entrance. 4 bed/3 bath home on 18.66 acres w/ stream, in perfect spot to build a pond. Privacy, no restrictions and luxury. Grand entrance w/ crystal chandelier and mosaic inlay on porcelain foyer floor. Formal dining and living rooms on either side of foyer w/ arched windows. Basement for extra storage or recreation. Home has security alarm, also motion lighting around home exterior. Very clean and modern decorative paint colors.